We are joined today by Dr. John Bergsma for an interview about his new book, “Yes, There is a God and Other Answers to Life’s Big Questions.” Dr. Bergsma is a member of our Board of Advisers and does street evangelization with us in Steubenville & Pittsburgh. Special Discount: For all our evangelization teams, the publisher has graciously offered two discount levels: 1) a 50% discount ($6.48/copy) for orders of 25 or more books and, 2) a 60% discount ($5.18/copy) for orders of 35 or more copies. This discount does not include standard shipping. To order copies for your team, use the following order form. Members can also order copies at a discount our online store here. Dr. Bergsma, thank you for taking time out of your busy teaching schedule to talk about your new book. Before we get into the book, can you talk a little about your experience evangelizing with St Paul Street Evangelization? 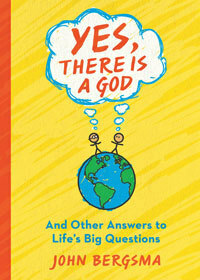 What inspired you to write “Yes, There is a God and Other Answers to Life’s Big Questions”? Did you have a particular audience in mind? As I mentioned, I had this conversation with an atheist that forced me to go back to the beginning, make an argument that God existed, and build my way toward the Catholic Church. In the heat of the moment, I focused on the concept of self-giving love, and found that it had some traction with my dialogue partner. On the way home from Pittsburgh, I thought: Wouldn’t it be good to have a book that laid out the steps from atheism to the Catholic Church? Can you talk about how you set up the content of the book for the goal of changing hearts and minds? What types of arguments does the book make for becoming a disciple of Jesus Christ in the Catholic Church? The book is staged throughout as this conversation between two stick figures standing on planet earth as it hurtles through space. One is my alter ego; the other is a dialogue partner who raises questions I think most people would ask about God, Jesus, and the Church. The stick figure that is my alter ego says, “Whether we look up, down, all around, or inside, we see signs of God!” I follow that up with arguments for God’s existence from nature (up, down, all around) and morality (inside). Then I move on to ask, “Has this God ever spoken?” which leads us to consider Jesus Christ, the most famous prophet in world history. After encountering Christ, I move on to consider which Church to belong to. I argue that if you just step back and look at all the different churches out there, one stands out as absolutely unique in its age, size, diversity, and universality. It’s the logical Church to consider first. As someone who became Catholic after serving as a pastor in a Protestant church, how would you say Catholic evangelization efforts differ from Protestant efforts? Protestant efforts are often focused on getting someone to pray to “receive Jesus as Lord and personal savior.” That’s good, but afterward Protestant efforts go in a variety of directions, if any direction at all. Protestant theology is weak on the role of the Church or the sacraments, or what exactly is necessary after “inviting Jesus into your heart.” Catholic evangelism also wants to bring people to an initial encounter with Christ, but it is more aware that it is inviting people to a long-term commitment involving incorporation into the Church and reception of the sacraments. The biggest challenge was keeping things simple. I tried to write for my twelve-year-old daughter, or really even below her level, because she’s a strong reader and knows a lot of Catholic terminology. When I was in urban ministry, the majority of the people I encountered were not strong readers, and I think that is often the case when doing street evangelism, too. A lot of Christian literature presumes a college-educated readership, and in particular much Catholic literature slams people with phrases like “total consecration to the immaculate heart of Mary,” and people don’t know what the words “consecration” or “immaculate” mean. I tried not to use any religious vocabulary. When telling the stories of the Gospels, for example, I don’t use the term “disciple,” I speak of Jesus’ twelve “students.” That is what the word “disciple” means, but nowadays folks don’t know that. I want people to hear the Gospel afresh, not confused with a lot of only-partly-understood religious terminology. … But try describing Jesus’ sacrificial atonement on the cross without religious language or presuming any religious education. It’s not easy to do! How do you see our evangelists best utilizing your new book to share their faith? What should they tell someone about the book when they are giving it away to a friend or someone they just met on the street? If you are having a good conversation with someone who seems genuinely open, but for some reason it’s time to part, you could hand this book to them and say, “Here’s a book that explains the Catholic faith from scratch.” Or, “This is a super simple book that shows why a person would believe in God, Jesus, and the Church.” Or, “This book talks about the big questions everyone avoids. I’d love it if you could read it and then we could discuss it.” Make sure to write your name and phone number in the book in case they ever want to follow up. I would recommend opening a page so that they can see the stick figures. It’s disarming; plus, it creates curiosity. 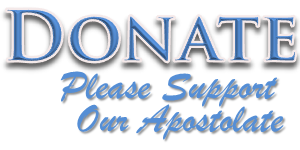 Once the book is in someone’s hands, do you have any recommendations for Catholics to follow up with those they want to help come to Christ and His Church? Few people are going to be instantly converted by a single book. What “Yes, There is a God!” will do, however, is map out for people the journey from doubt to faith, from beginning to end. The vast majority of people have never seen it mapped out so simply and quickly. Still, I had to sacrifice a lot of details in order to show the big picture without losing people’s attention. Now, most people are going to get hung up at some point on the way, where they will want to go deeper. That is where you as the evangelist want to help them out. Some, for example, won’t buy one of the arguments for God’s existence in the first chapter. Someone else will accept all that, but want to talk more about why Jesus is different from other religious leaders in history. A third person may cruise all the way to the chapter on the Church, but then want to argue. Reading this book is almost like a diagnostic tool. If you can get them to read it and share with you where they got “hung up” or where they still have questions, then “bingo!” You’ve found the “itch” that they need “scratched” in order to become Catholic. Is there anything else you would like to share about your new book? This was the hardest book to write that I have ever written. I’ve written a doctoral dissertation and a 1500-page textbook on the Old Testament. They took longer, but were easier to write. I felt a lot of spiritual opposition writing it, as if I was struggling to walk upstream against a current of darkness. I hope that’s a good sign, that the enemy didn’t want this written, and that the book will do some good for the Kingdom. If even one person becomes Catholic because of it, it will have been worth it. John Bergsma, PhD, is a professor of theology at the Franciscan University of Steubenville and a senior fellow at the St. Paul Center for Biblical Theology. He also serves as a member of the board of advisers for St. Paul Street Evangelization. Twice voted “Faculty of the Year” by graduating classes at Franciscan University, he is a popular teacher whose love of Scripture inspires his students. The author of “Bible Basics for Catholics: A New Picture of Salvation History,” he is a frequent speaker at conferences and parishes. He and his wife, Dawn, live with their eight children in Steubenville, Ohio.